OK, enough of an introduction, let’s bring David in to the conversation! Thank you so much for taking the time to meet with me and my readers, David! Please share with us, as a brand new Author, what has it been like for you to publish such a profound New Story of Creation, as well as winning the Nautilus Award and being called ‘a Kahlil Gibran for the 21st century’ in one of your reviews? It’s been a wonderful affirmation of this work, and I say “this work,” versus “my work,” because it feels like the work somehow came through me. Yes, I am the author, but, saying “my work” would be like not giving credit to whatever mysterious process brought this work through me. 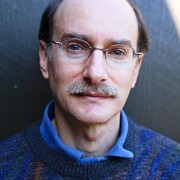 At any rate, it’s nice to have one’s efforts acknowledged, but even more than that is the fact that this story is being acknowledge by outside judges and reviewers, and this acknowledgement supports the real effort, which is about bringing a new story for this time to help us get through the ecological, social justice and spiritual crises that we face. We really do need a new story as to who we are in the Universe, if we are going to survive and thrive through this transformation that we are currently facing. This recognition is also an affirmation of what I’ve been receiving from readers. I’ve had readers say amazing and wonderful things like, “I really am enjoying the way your narration navigates the ancient and the modern worldview and the story of creation.” It’s truly heartening to know that there are people out there who are hungry for this message and who find this particular take on our Creation Story a useful guide to help them through these crises. Knowing that there are such passionate people out there really helps someone like me keep going in bringing the best I can out to the world. Congratulations on such a masterpiece, David! 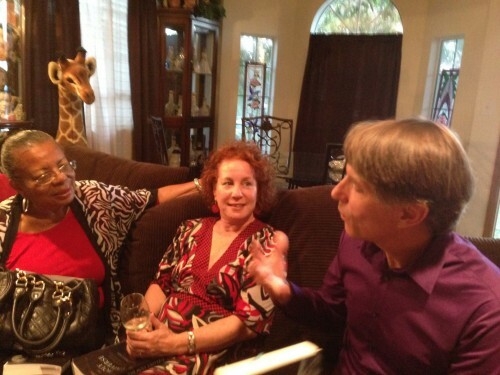 From your many speaking engagements and book store signings, can you please share with us what has been the most predominant “AHA” moment for your readers? If it is too challenging to choose only one, then share two. There are two things that really stand out. The first one I’m afraid I can’t talk about here, as it would be a “spoiler” of sorts. It’s one of a couple of surprises in the book. 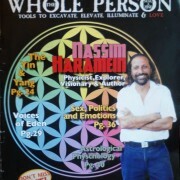 However, I do offer a free chapter for download, called “The Gospel of the Universe,” which reveals this little surprise about the Sage, so if you’re readers are interested, they can go to http://theholyuniverse.com/downloads-available/. The second one is how deeply people respond to hearing a Genesis story—that is, a story of humanity’s creation—that is science-based, yet told in a metaphorical and poetic way that really resonates with people’s souls. I find that people who call themselves “spiritual but not religious” often lack a coherent story that goes beyond the scientific facts of the Universe. The new story that came through me captures the same mysterious essence that our ancient scriptures capture, an essence that we need, that poetic and metaphorical essence, because we literally cannot survive on facts alone. And when I say literally, I mean literally: the fact that we do not have a collective coherent story that is harmonious with the ways of the Web of Life has led us to the brink of ecological and social collapse. You say this book is geared for the “spiritual but not religious” folks. Yet, one of the things I enjoy so much about your book is the neutrality of it, the flow of Unity as the web of life. So have you been surprised to find so-called religious people enjoying The Holy Universe? The main “religious” folks who have been interested in this book have been from the so-called “new thought” churches, such as Unitarian Universalists and Unity churches, some United Church of Christ congregations, the Centers for Spiritual Living, as well as liberal Catholic Sisters. Thomas Berry, by the way, was a Catholic priest whose work I drew heavily on as well as other theologians, scientists and thinkers. There are also a lot of Catholic sisters who are very interested in the new story, and who have expressed their enthusiasm for my book. As far as more mainstream religious folks go, I was very surprised at one point when I was presenting to a college anthropology class, and one of the students raised her hand and said, “I became a Christian last fall.” My immediate response was, “Uh oh. Here it comes.” But then she said something like, “I found this book very useful to help me understand how God used Evolution to create the world.” I certainly didn’t expect that response. There’s a related surprise to this question. One of the lessons I learned is that environmental and social justice activists, to a large degree, have tended to shun any kind of religious references, or anything that smacks of spirituality. This doesn’t pertain to all activists, of course, but there does indeed tend to be an aversion to things spiritual in activists communities. This theme of unity, of collaboration, of One-ness, is so vital at this unprecedented time of mass chaos and tragedies. As you write this so eloquently, do you also believe it to be true, or is it more of a hope? 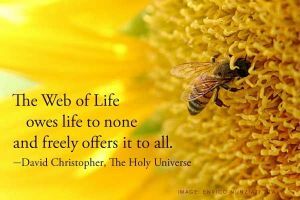 It is a fact of the web of life. All creatures are indeed deeply interdependent on one another. Our Modern Mind—which is a term that the Sage uses—has been ignoring this, and while it has taken a few thousand years for us to feel the result of this worldview, we are now able to clearly see the consequences of what happens when you go against the lessons of the Web of Life. 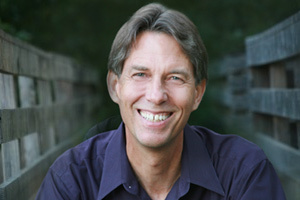 That doesn’t mean that there isn’t competition within this interdependence; that doesn’t mean that there isn’t suffering. But deeply embedded in the Web of Life is a deep sense of cooperation, a deep sense of give and take. When a lion is hunting a gazelle, she doesn’t take the entire herd. She only takes what she needs. As a contrast, Modern Mind looks at the lions, herds of gazelles, oceans, mountains, forests, prairies—all the bounty of the Web of Life, and then objectifies them by calling them “resources,” which means they only have worth if they are immediately useful to human beings. Otherwise we call them things like wastelands or pests. 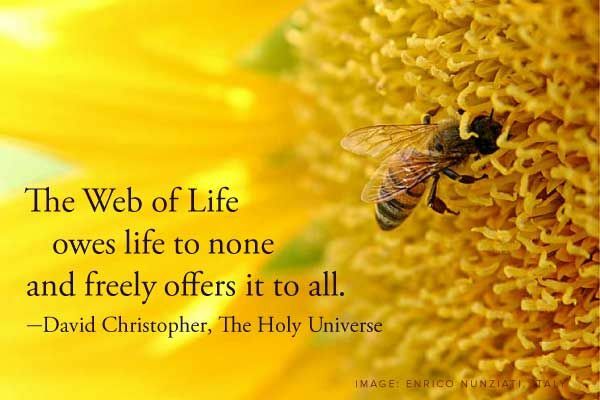 We don’t realize how all creatures are vital parts of the Web of Life. A big part of your IMMENSE vision is to bring people together through The Holy Universe, so that there is community support and activism as a result of resonating with the Planetary Mind. Please share with our readers how they can participate in one of these book clubs or through social media? I offer a “call-in book club” for The Holy Universe every six weeks or so, and it’s a chance for our readers to converse and dialogue with me and one another. We dive deeper into the writings and ideas in the book, dialogue about them amongst one another, and have a chance to ask questions that participants have about the book. Our next call is scheduled for January 14th, 2015. 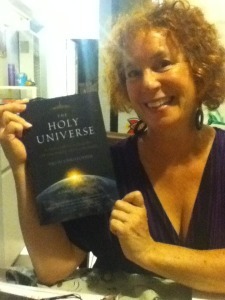 Readers who are interested can learn more about signing up at my website at http://theholyuniverse.com/call-in-book-club/. I have communities on Facebook and Twitter, where you can keep up with me, as well as enjoy excerpts and quotes from the book. And I’m available for speaking engagements at churches and living room readings; people can also visit my website to find out more about that. I also have some appearances happening in the Spring. I’ll be doing a reading on Friday, March 13, 2015 for the “Live My Best Life” Speaker Series at the Agape International Spiritual Center in Culver City down in the Los Angeles area, and I’ll also be doing a longer workshop at the Sophia Center at Holy Names College in Oakland in April. I have other events in the works, so if your readers are interested, they can sign up for notifications about them through my website. 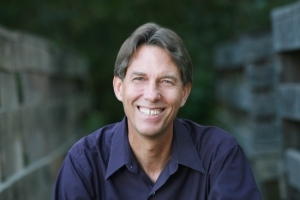 When I get the time, I also would love to start offering longer call-in seminars for people who want to dive deeper into how this evolutionary story means to you as you make your way through the Great Transformation. Thank you so much for your time, David. It’s truly been an honor. In conclusion, what would you like to people come away with after reading your book or participating in one of your programs? The main thing I want people to know, whether they read my book or hear me speak, is to remember what we as Modern Mind have forgotten, and that is this: we belong here. I belong here. You belong here. Anyone reading this blog belongs here on Earth. You are not fallen, like some religious stories have told us. You are not flawed like more modern stories have told us. Yes, you may have issues and wounds, but fundamentally there is nothing wrong with you. You are an expression of the cosmic creative drive of the Infinite. The Universe took 13.8 billion years to create you, and I mean that literally. In one sense, it’s fantastic and wonderful, in another sense it is scientific truth: You belong here. You also have a responsibility. We are learning that there are deep, sometimes irreversible consequences to our actions. Yes, each of us belongs here, but we also have a responsibility to Earth, to humanity, and it is vital that you take responsibility in finding out what your work is in the world, to discover that unique contribution you have to make that engages your passion in a way that is of deep service to addressing the crises of our time. David loves to support local bookstores (they can order the book if it’s not in stock), or you can buy the book directly through The Holy Universe website or, of course, you can always order it through Amazon.